Most Israelis are wary of Donald Trump. Where does Donald Trump stand on the Arab-Israeli conflict? As with so much else, the only consistent feature of Trump's remarks is their off-the-cuff and contradictory nature. Trump's foreign policy thinking might be truly as shambolic as the sentences in which it is expressed. Alternatively, there might indeed be method behind the madness. Yet whether or not one is charitable towards the controversial tycoon, all indications suggest that a Trump presidency would recklessly jeopardize the stalwart alliance between the United States and Israel, and thereby endanger the security of the Middle East's sole democracy. On the one hand, Trump's comments appear virtually impossible to interpret into coherency. At his AIPAC speech, Trump announced that he would dismantle the Iran Deal, then five minutes later declared that he would enforce it. Sometimes he expresses a certain indifference to the Jewish state: similarly to Bernie Sanders, Trump has announced a policy of neutrality between Israelis and Palestinians, adding that he "want[s] to go in with a clean slate" in lieu of pledging to defend the security needs of the US's most dependable regional ally. Disturbingly, Trump has stated that "a certain amount of surprise, unpredictability" would be key to his negotiating strategy, announcing a game plan involving yet more chaos into an increasingly chaotic Middle East. 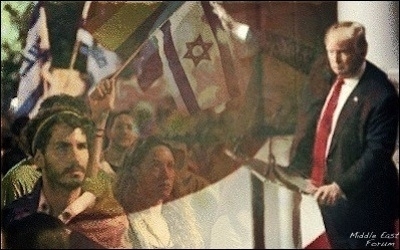 At other times, Trump has blamed Israel for the enduring conflict, speculating, "I don't know that Israel has the commitment" to make peace, and effectively exonerating the Palestinian side when he said that peace depends on "whether or not Israel," rather than the rejectionist Palestinian leadership and jihadi forces, "wants to make the deal ... they may not be." Trump has blamed Israel for its enduring conflict with Palestinians. To be sure, Trump has made pro-Israel noises — and very loud ones this week at AIPAC's policy conference. "My daughter is married to a Jew who is an enthusiastic Israel supporter," Trump has said, which is about as compelling proof of pro-Israel affinities as "my best friend's a Mexican." With customary braggadocio, Trump has asserted that "the only one that's going to give Israel the kind of support it needs is Donald Trump." But there is little in his other utterances to commend this sweeping pledge. Just before ascending the AIPAC stage, Trump astonishingly hinted that he expected Israel to repay American military aid. As an analysis of Trump's recent speeches has shown, he commits a "misstatement" every five minutes. How can a man so inclined to mistruths be trusted with the delicate business of diplomacy and global politics? And a man who has suggested that the US should withdraw from NATO, at that. Those inclined to buy Trump's protestations that he is "currently [Israel's] biggest friend" will struggle to rationalize his ersatz record of public statements. Trump is a man of principles, to the extent that those principles are expediency and opportunism. On the campaign trail, he has demonstrated a remarkable ability to say or do whatever will maximize votes, then shamelessly flip-flop if need be. It is exceedingly difficult to decipher any discernible commitment from Trump to values or causes of any kind, other than his own brand. A President Trump would likely play just as recklessly with America's regional alliances as President Obama, further endangering the growing threats to the liberal world order America has fought so tirelessly to sustain just when it most needs rehabilitating. Trump thinks he can engineer a diplomatic breakthrough between Israelis and Palestinians. So much for Trump's seemingly anarchic record of public statements. Yet the real danger may lie in a method, the outlines of which one can begin to detect behind the madness. Given the historic temptation for U.S. presidents to attempt to solve the Arab-Israeli conflict and Trump's self-perception as a master dealmaker, it appears that Trump is convinced that he can engineer a brilliant diplomatic breakthrough. Indeed, at AIPAC he was at pains to stress his authorship of a book on negotiations. But The Art of the Deal is a shoddy grounds for geopolitical chess-playing. His statements betray no understanding of the nuances of the fragile geopolitics, and every indication that he impatiently and impetuously believes that all that peace requires is that an American president rely on his business acumen to force a deal. But as Senator Marco Rubio put it, the Arab-Israeli conflict is "not a real estate deal." It is replete with complexities that demand perseverance, trust-building and ingenuity — in short, traits that are difficult to imagine in a presidential candidate who had yet to appoint a foreign policy team until a few days before his March 21 AIPAC appearance. The collision between Israel's sober realism and Trump's grandiose self-confidence is a recipe for unnecessary friction. An impatient rush to achieve a final-status agreement without any attention to the underlying, historical and structural reasons underlying the impasse would likely explode spectacularly in Israel's face and risk further conflagration. Israel understands that repeating this "peace summit" strategy will not work without attending to the underlying causes of rejectionism and instability on the Palestinian side, and will resist the imposition of tried-and-failed methods. The collision between Israel's sober realism and Trump's grandiose confidence in his own abilities is a recipe for unnecessary friction between Jerusalem and Washington. All of the other Republican candidates – and even Hillary Clinton to some extent – believe that the next president must reaffirm and repair the U.S.-Israel relationship. They recognize that Israelis are most willing to make sacrifices in pursuit of peace when they are most secure, while Israel's enemies are least willing to compromise when they see daylight between Washington and Jerusalem. Trump's apathy towards Israel, or else his hubristic belief in his own negotiating powers as a panacea, risks further damage to this irreplaceable transnational alliance. The writing is on the wall. It is not too late for Republicans to heed it. Gregg Roman is director of the Middle East Forum. Eylon Aslan-Levy is a British-Israeli writer and political commentator.